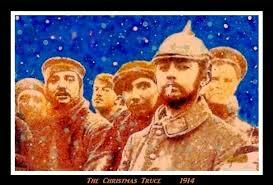 In a place where bloodshed was commonplace and where men lay shivering in muddy trenches, something surprising occurred on parts of the Western Front at Christmas in 1914. In one of the truest acts of goodwill toward men, a small number of soldiers from both sides in the southern portion of the Ypres Salient set aside their weapons and hatred, if only temporarily, and met in No Man’s Land. 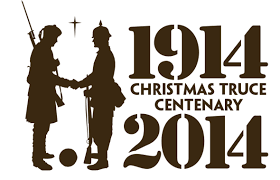 This Christmas, we remember those who were in the trenches 100 years ago.. and the 81 British casualties who were killed on Christmas Day 1914. As a change from their usual, annual Festival of Christmas Trees, St Andrew’s Church at Barrow Hill hosted a “WW1 Christmas Truce Centenary” coffee morning and a carol service led by the Staveley and District United Churches Choir. Christmas trees, decorated by service organisations, local schools, churches and relatives were on display.